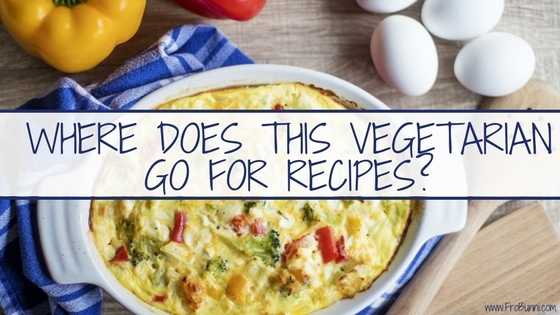 FroBunni: Where do I Get Vegetarian Recipe Inspiration? When I first thought about becoming (mostly) vegetarian, I was a little unsure of what I would eat. I'm a creature of habit, and I knew eating some fruit, eggs, oatmeal, and yogurt wouldn't provide me with enough nutrients to be healthy. And salads can be fun for only so long. So what did I do? I went to Google of course! And found...well, not much. There's not a lot of vegetarian blogs that I liked. When it comes to food, even though I have my favorites, there's still a lot I don't eat, like avocados, quinoa, chia seed pudding (chia seeds in my smoothies are okay), and various other fruits, vegetables, and grains. I thought I would eventually go back to eating meat with no variety in my diet, until one day I found myself watching hair videos, specifically The Chic Natural. While I was watching one of her hair videos, I noticed she had videos on vegan recipes. Intrigued, I decided to check them out. While watching the video, I realized her vegan recipes could be adapted for my vegetarian lifestyle. After watching three more of her videos, I realized that I didn't need to find people who were making vegetarian meals, I already follow them. I just needed to adapt their food to fit my preferences. Along with Pinterest (because you can never get enough ideas from Pinterest) here are some of my favorite people and sites I go to for vegetarian meal inspiration. The Chic Natural: Even though the chic natural is vegan, it's easy to adapt her recipes to fit mine. In fact, it's pretty seemingly. Where she uses almond milk, I use regular milk. When she uses nutritional yeast, I use cheese. Her recipes are very accessible, aren't complex, and only require, at most, 30 minutes in the kitchen. It's a win-win. Fit Men Cook: Kevin of Fit Men Cook makes mostly keto based recipes, but what's great about his recipes is, even without the meat, they're still chocked full of protein. His salads are very creative, and even better, inexpensive and easy to make. Natural Vegan Mama: Natural Vegan Mama reached out to me after I made a Facebook post featuring women with long, natural hair. I checked out her YouTube page, and she makes vegan looks so easy and effortless. From reviews on vegan cheesecake, recipes, and grocery hauls, her channel shows you the day to day life of a vegan. And her cauliflower fried rice is amazing! I made some last week and it definitely tasted like I picked up some Chinese take out. Simple Green Smoothies: I can thank my love of green smoothies to Simple Green Smoothies. And while their 30-day green smoothie challenge is a thing of the past, they have super delicious recipes on their Instagram page. When it comes to a quick breakfast, snack, or even light dinner, I rely on them to provide me with a healthy, quick, and easy meal. Who do you follow for food inspiration?